We expect growth to slow from +3.4% y-o-y this year to +3% in 2019. The 2019 forecast sits in the higher half of the official government expectations of +1.5% to 3.5% GDP growth. Our Singapore economist says growth moderation will come from rising interest rates, the impact of property cooling measures that weigh down on the real estate and construction sectors in coming quarters, waning demand for electronics products and some drag on export performance arising from trade wars in the near term. On the currency front, the Monetary Authority of Singapore (MAS) normalised its SGD policy with two tightening moves in April and October by slightly increasing the slope of its SGD nominal effective exchange (NEER) rate band. Our currency strategist sees upside risk for the USDSGD as USD strengthens against the currencies of Singapore’s major trading partners. The USDSGD could rise to as high as 1.44 in 2Q19 before tapering off to 1.42 by end 2019. After a year of strong growth from 2Q17, the trend reversed in 2Q18 once risks picked up at the beat of the trade war drums. Earnings cut for the last two quarters took growth forecast down from 16% to 12.2% for 2018, while growth in 2019 will slow further to 5.7%. This headline EPS growth risks further downward going forward as corporates have started to warn of dark clouds looming for next year, and as the full impact of the proposed tariffs for US/China trade kicks in. A key driver of earnings growth in 2018 was the banks, at an exceptional 26.9%. The sharp slowdown in growth for banks to only +7.7% y-o-y in FY19F was exacerbated by moderating loan growth, provisions normalising which offsets rising NIM. Our sector pick is UOB. 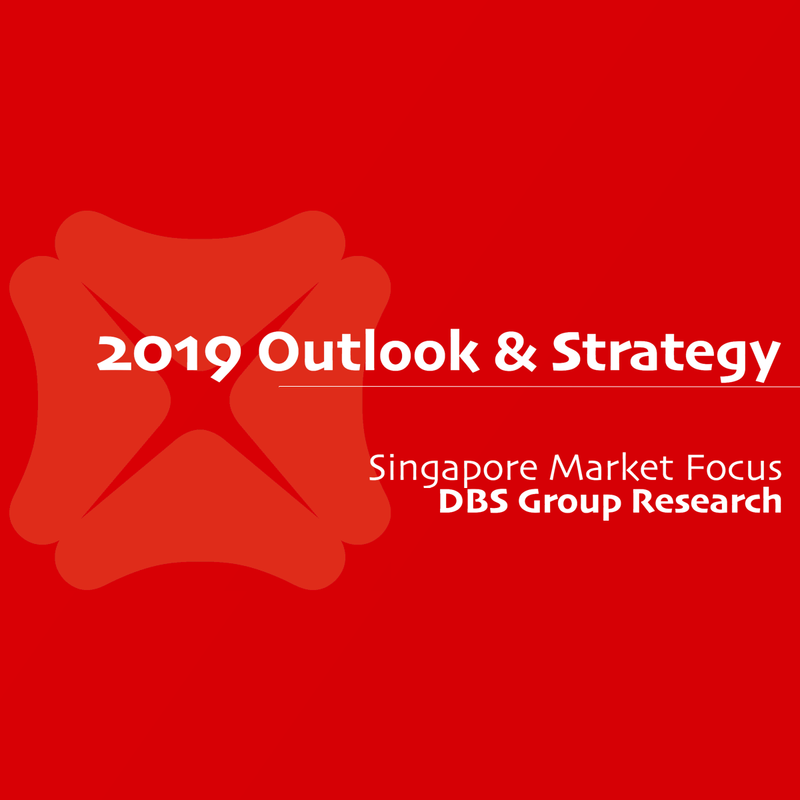 EPS growth for the consumer goods sector (picks Thai Beverage and Sheng Siong) is expected to pick up to 8.7% y-o-y next year from 1.4% this year driven by a mix of lower base expected for FY18, revenue and margin expansion. We are overweight on the retail and industrial REITs sector that has lower downside risk to earnings and in the case of the larger industrial REITs which offer a larger buffer due to a higher absolute yield. Our SREITs picks are CapitaLand Mall Trust, Mapletree Logistics Trust, Frasers Logistics & Industrial Trust and Mapletree North Asia Commercial Trust. We are also overweight on the telecommunications sector as TPG’s abysmal capex so far implies room for positive surprise in 2019. The sector top pick is Netlink NBN Trust. 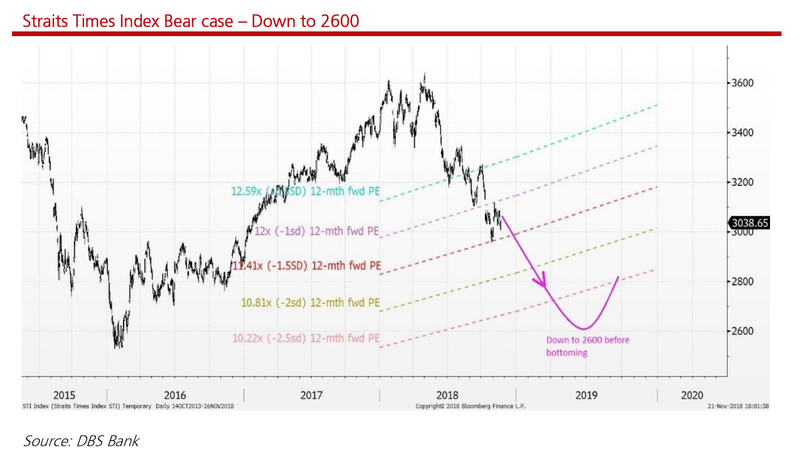 In our 2H 2018 Singapore Strategy titled “Buckle up for a rough ride” dated 4 July, we warned of a bear case scenario if the STI declines to 2915 should the US-China trade tension threatens to degenerate into an all-out trade war. The recent decline to the YTD low of 2955 vindicates this cautious stance. The Singapore market currently trades at 11.65x (-1.5SD) 12-mth fwd PE. Except for the 2008-2009 GFC when 12-mth fwd PE valuation sank to 9.8x (-3SD) 12-mth fwd PE, two major bottom inflexion points had occurred at the 10.9x (-2SD) 12-mth forward PE level – once during the height of the Eurozone crisis in 2011 and the other in 2016 amid recession fear and a collapse in oil price. Short of another global crisis, this observation suggests that the bottom for the Singapore market is getter closer with a 7% downside risk to the inflexion point. An end to the US-China trade hostilities has not gotten anywhere nearer since it started earlier this year. The current focus is on the Trump-Xi trade talk at the end November Group of Twenty (G20) summit. While a truce would be positive for Asian stocks, Trump has also threatened tariffs on a further US267bil of Chinese imports if there is no agreement that would risk an escalation to an all-out trade war. Uncertainty seems the only certainty. 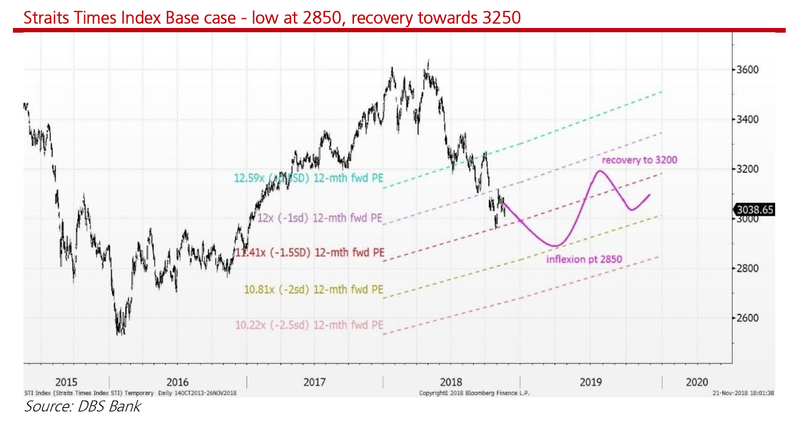 Base case preferred view – Low at 2850, recovery to 3250. US tariffs on China stop at 25% on USD250bil imports. US-China trade hostilities do not degenerate into an all-out trade war (25% tariffs on all imports upon each other and China introduces qualitative measures). US inflation stable around 2%, upward wage pressure stabilises. FED hikes rates twice, at most three times next year that lifts the FED funds rate to an anticipated 3% to 3.25% and pauses. US 10-yr yield peaks at/before 3.6%. USDCNY does not extend beyond the 7.2 ceiling in 2Q forecasted by our currency strategist. Subsequent USDCNY pullback sees recovery in Asian currencies, including the SGD. 7% downside from 3050 to an inflexion point at 2850 in CY1Q19 pegged to 10.81x (-2SD) FY19F PE. Followed by a recovery towards 3250 pegged to 12x (-1SD) blended FY19/20F PE on an oversold valuation trade, attractive yield and investors looking beyond trade disruption to diversion. Bear case – Down to 2600. Condition 1: All-out trade war. Qualitative retaliation can be more uncertain than tariffs because it is “open-ended”. Condition 2: FED goes 4. Our Chief Economist’s above consensus of 4 rate hikes next year comes true, FED funds rate at 3.5% by end 2019. US 10-yr yield goes beyond 3.6%. USDCNY rises beyond the 7.2 ceiling in 2Q forecasted by our currency strategist. USDCNY weakness further drags down Asian currencies, USDSGD goes beyond our currency strategist’s forecast of 1.44 by 2Q19. ‘Extreme’ -3SD valuation peg coincides with GFC low.